When it comes to headsail handling, size plays a big role. David Flynn of Quantum Sails talks about optimizing your sail plan for the most effective and efficient program. Headsails are getting smaller on the latest generation of boats as designers, builders and sailors embrace the ease of handling and simplicity provided by large mainsails and smaller foretriangles. Genoas no longer exist on modern racing boats, but the day of the overlapping genoa is also numbered for cruising sailors. They will not be missed! Roller furling has been standard issue for generations and still the go-to system whenever possible. On sails with overlapping headsails this is typically a medium to large roller furling genoa. For the latest designs this can be a non-overlapping sail that is as large as possible but still fits in the foretriangle. Having the right sized headsail with the right amount of overlap will make all of the difference when it comes to handling and managing it. Here are the factors you’ll need to consider and some options to meet your needs. The larger the mainsail relative to the headsails, the smaller the genoa needs to be. Check the foot length of the mainsail ("E") versus the base of the foretriangle from mast to stem ("J"). If they are equal, or if E is longer than J, the boat relies more on its mainsail for horsepower and the jibs can be smaller. 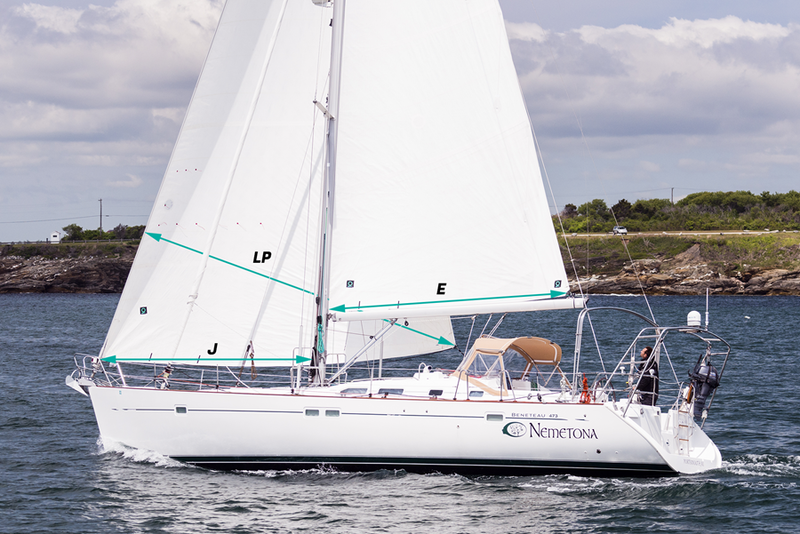 The latest performance cruising boats have huge mainsails and use non-overlapping jibs as the primary sail. On the other side of the coin, more traditional cruising boats have relatively small mainsails and big "J" dimensions. These are genoa dependent, and will need larger headsails. LP is the shortest distance from clew to luff. It is expressed as a percentage of "J" (150% LP = 1.5 x J). It does not relate directly to area, but is a measure of overlap. For a given percentage of overlap, you get a much bigger sail on a boat with a long J dimension. The make-up of your crew and your normal conditions aren’t part of your boat measurements, per se, but they are important factors to keep in mind as you make an optimized sail plan. The larger, stronger and more experienced your normal sailing companions are, the bigger the sail you can manage. Power winches can assist in sail handling as well. When considering what size headsail will be best for your boat, factor in the average wind speeds for the region in which you will sail most frequently. Going larger (say from a 135% to a 150%) is usually only a benefit in under eight to ten knots of breeze. Additional LP is a liability in more breeze. It is also only of marginal, if any, benefit while reaching and running. With sheets eased, most of the back end of a genoa is turned back into the boat. A higher clew is actually the biggest help when reaching because it keeps the sheeting angle consistent so you don’t lose the top of the sail. Genoas for roller furling are usually sold on the premise that they can be used partly furled. This is true from a structural standpoint if allowances are made in the initial construction. Shape deteriorates with the amount of sail furled. 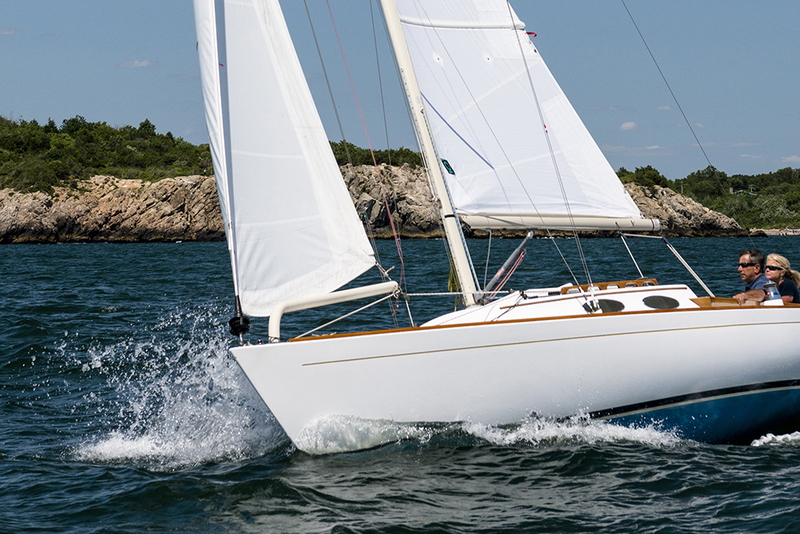 Most sailmakers will quote reasonably effective reduction of up to 30% of the original LP. Beyond this, you have a triangle but not much of an airfoil. When sailing off-the-wind this probably isn't that important, but it is if you want to go upwind. The bottom line is that handling and versatility considerations suggest keeping the genoa as small as possible. Build only enough size to maintain the ability to drive the boat reasonably well in light to moderate conditions. The more easily the boat drives, and the larger the mainsail relative to the headsail, the smaller the LP can be. Now that we’ve looked at all the factors needed to make an informed decision on headsail size, let’s look at the working jib. For serious offshore work, a smaller, second headsail is required. The second headsail should be a heavy working jib, with an LP between 85% and 100%. In more than 15 to 18 knots of breeze, depending on the same performance versus foretriangle size considerations which applied to the genoa, this will become the sail you will need. If the boat were staying strictly in a light air area, it would be the sail of choice in the spring and fall, or whenever windy conditions were anticipated and could be used on the primary roller furling system. However, the difficulty of changing sails on a furling system should be recognized. For sailing offshore, building this sail for use on an inner forestay installed separately with some type of quick release mechanism should be considered. The stay should be located well forward (unlike the classic cutter layout which puts the stay 40% of J aft), so that the working jib size does not get too small. It needs to remain large enough to be useful. In light air and constricted water, the inner forestay could be secured at the mast most of the time. This setup would allow the sail to be hanked on and ready to go when sailing offshore, and would avoid the somewhat messy change from big sail to little sail on the furling system. Roll the big sail up, attach a halyard, and hoist. The genoa could still be designed to allow for partial furling, but there is no substitute for having a purpose-built small sail for the job. Having the small jib will also protect and extend the life of the genoa, and provide needed insurance against complete sail failure when far from home. Offshore, the working jib is likely to be the correct sail a large percentage of the time. The other beauty of a separate inner forestay is that it is the perfect place to hank on a true storm jib. The other possibility to consider would be to use a second conventional furling system on the inner forestay for the small jib. This is more of a true offshore configuration because the system will make it impossible to make the inner forestay easily removable. Tacking around the stay is the problem. However, for pure, never-go-up-on-the-foredeck ease, this setup cannot be beat. There is a third alternative; however: the structural furler. This is a relatively recent development that is now standard issue on Super Yachts and on high performance multihulls and single-handed racing boats. Instead of a permanent stay or a wire stay that connects when needed, the system uses a hi-modulus (aramid or PBO) super rigid torsional rope inside the luff of the sail. The furling system is a free flying top-down or bottom-up model that attaches to the torsional rope. On big cruising boats the sail is hoisted up and locked off and then tensioned from the bottom (usually with a hydraulic ram) to get enough stay tension. You don’t want sag in an inner forestay designed for a heavy air sail. Usually this also requires running backstays to help keep the mast straight and the stay tight. This is not a system you would try to hoist into place in breezy conditions. This should be set up at the dock in light air before heading out on a long passage. All of this, of course, comes at a price and really requires the boat to be designed around the system from the outset. Be sure to include your sailmaker anytime you look into optimizing your sail plan. Even if the result isn’t incorporating a new sail, having a better understanding of how your sails work together and which one to use when is invaluable. You might also be surprised to find an extra furler or some additional hardware could make all the difference in handling your headsail!